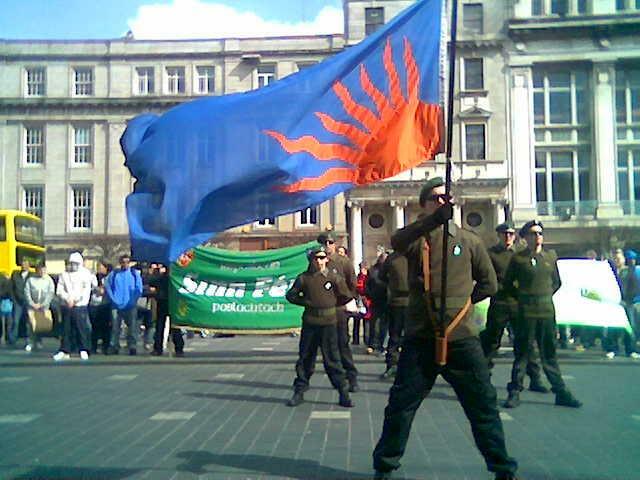 The Gal Gréine or Sunburst flag is one of the few symbols of modern Ireland and Irishness that can claim to have deep roots in native Irish and Gaelic tradition. 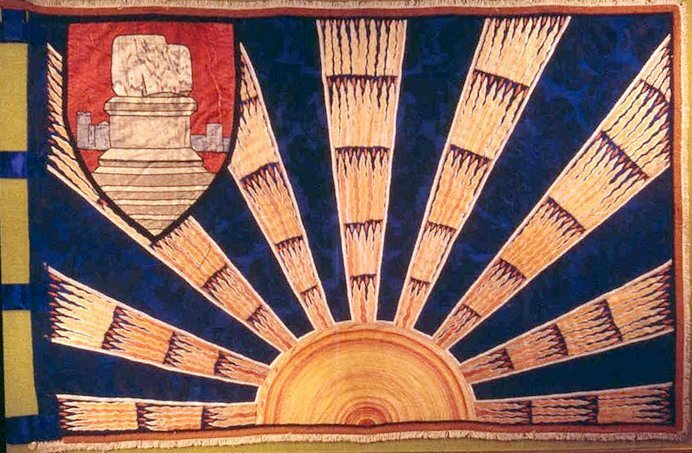 Also known as the Irish or Fenian Sunburst, stories and images of the banner have circulated among Gaelic communities at home and abroad since the late Medieval period, gaining popularity in the late 19th and early 20th centuries with its adoption by various nationalist and revolutionary movements. 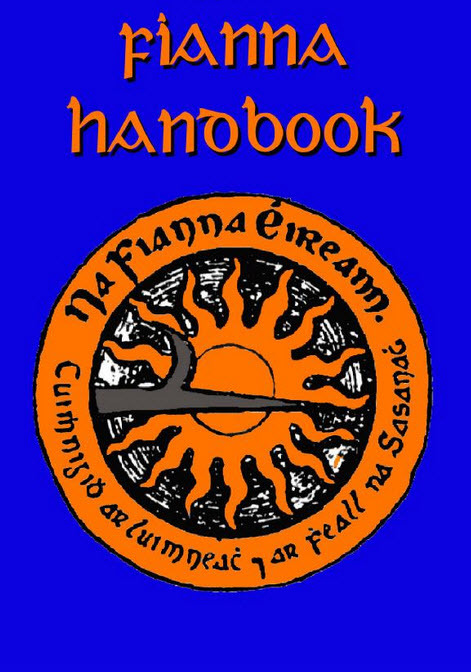 The earliest descriptions of the Gal Gréine standard are to be found in the Fiannaíocht or Fenian Cycle, a body of literary and folkloric tales within the Seanchas or indigenous mythology of Ireland, Scotland and the Isle of Man. 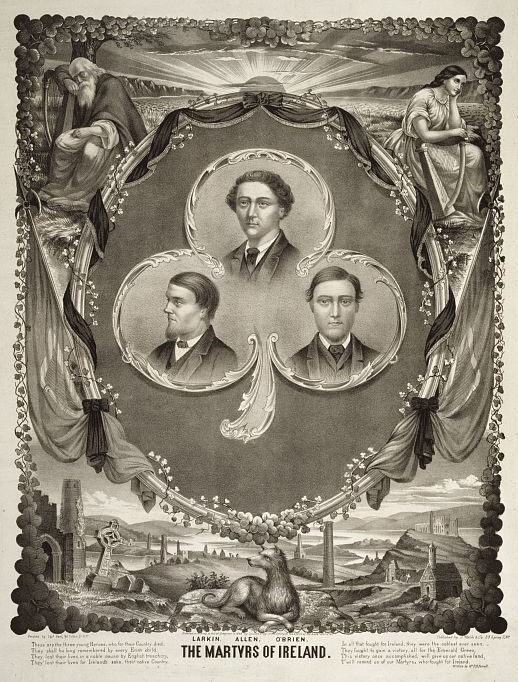 The Fenian genre recounted the adventures of various fianna or “hunter-warrior bands” in the Gaelic nations; companies of youths – usually, though not exclusively, of aristocratic male birth – residing outside the normal bounds of settled society until they came into adulthood through the inheritance of property. 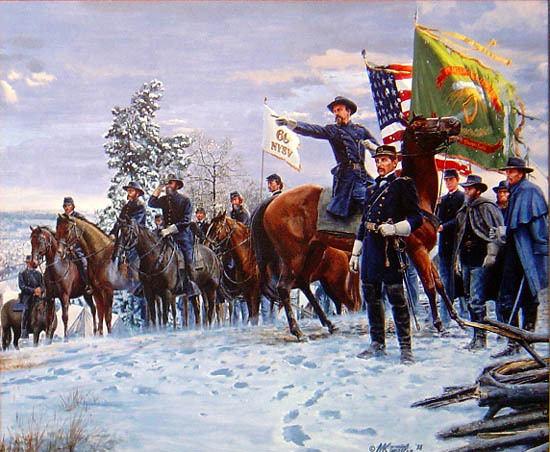 During this transitional period they survived by hunting and foraging in the wilderness as well as providing quasi-military services in return for food and lodging. Of these transitory groupings the one that reached pan-Celtic prominence was the troop of Fionn mac Cumhaill, a mythical féinní or “hunter-warrior” associated with the historical royal dynasties of the Connachta in the early centuries AD. 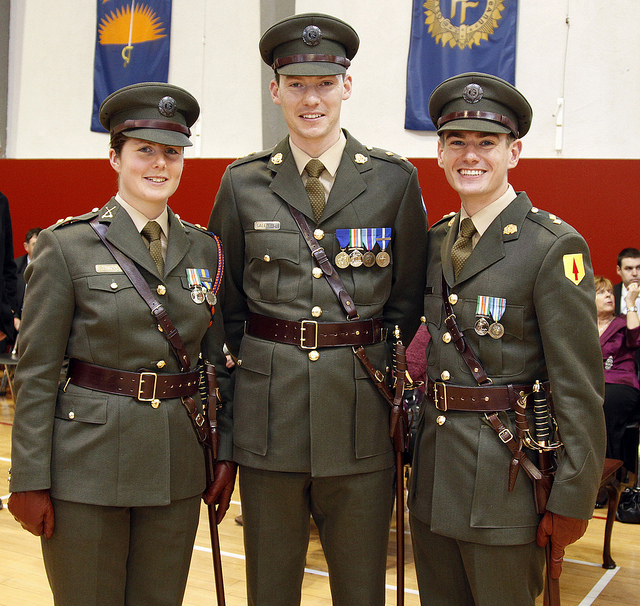 In legend Fionn commanded both his own fiann and that of several others while serving the ard ríthe or high kings of Ireland at Teamhair (“Tara”); principally Cormac mac Airt. 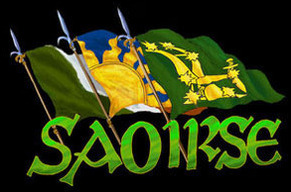 Fionn’s tales slowly evolved into a body of literature and folklore that stretched from the south-west tip of Ireland to the very north of Scotland (today when people speak of the Fianna they are invariably referring to the followers of Fionn the rífhéinní or “king-hunter-warrior” rather than other Fenian figures like Fothadh Canainn). 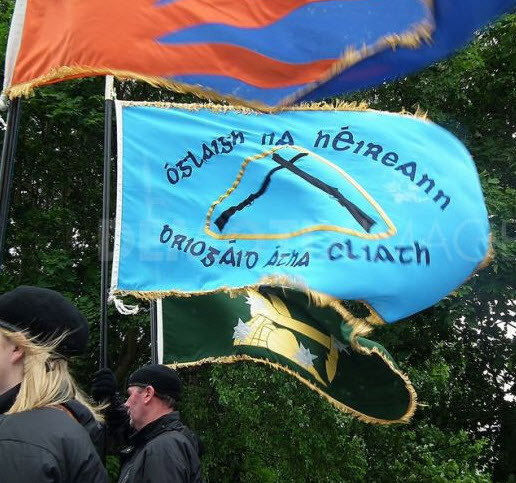 By the 1400s and 1500s the legends of the Fenian Cycle had reached their peak in a wide and varied series of poems, and it is here that we first encounter the descriptions of An Gal Gréine, the personal sunburst banner of Fionn mac Cumhaill and his fiann. 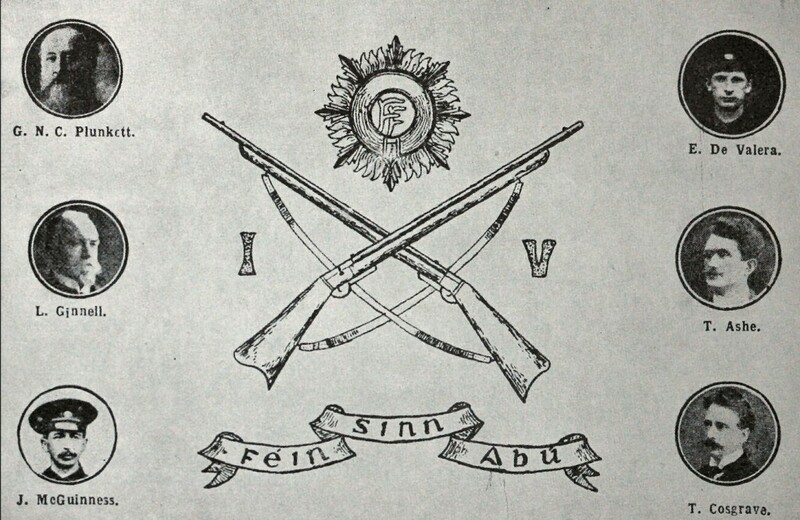 The oldest image that we have of this imagined battle-standard dates to the 18th century and a 1731 manuscript written just before his death by the Fermanagh-born Protestant writer Cathal Ó Luinín who lectured at Trinity College Dublin (he was part of the Seán Ó Neachtain circle of Gaelic scholars in the capital and is better known as one of the publishers in 1712 of an Irish language translation of the “Book of Common Prayer“; for this his name was anglicised as Charles Lynegar). There the Gal Gréine is described in some detail with an illustration by an unknown artist depicting a stylised golden semicircle emitting thirteen rays placed in the lower middle-half of a blue field, the edge of the flag representing the edge of the horizon. 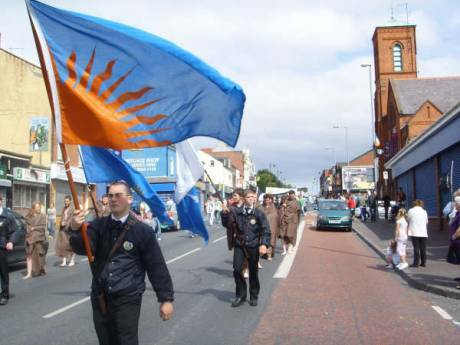 From the mid-19th century onwards the sunburst motif was adopted by many Irish republican organisations as a symbol of their revolutionary ideology. 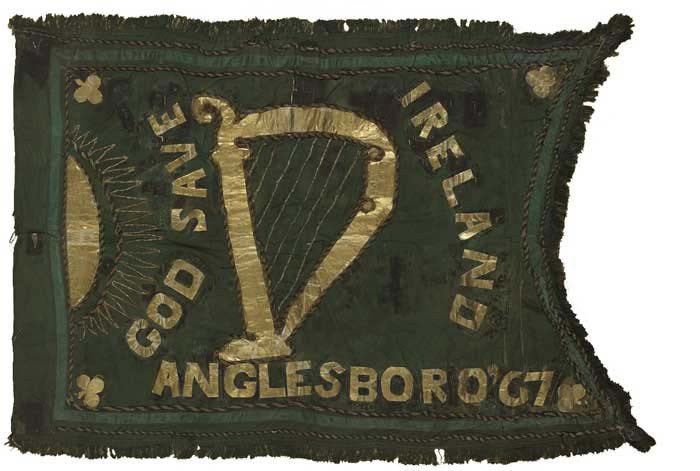 This was partly in opposition to the use of the “Irish Harp” for official purposes by the British colonial authorities in Ireland and those who frequently co-operated with them, such as the Irish Parliamentary Party. 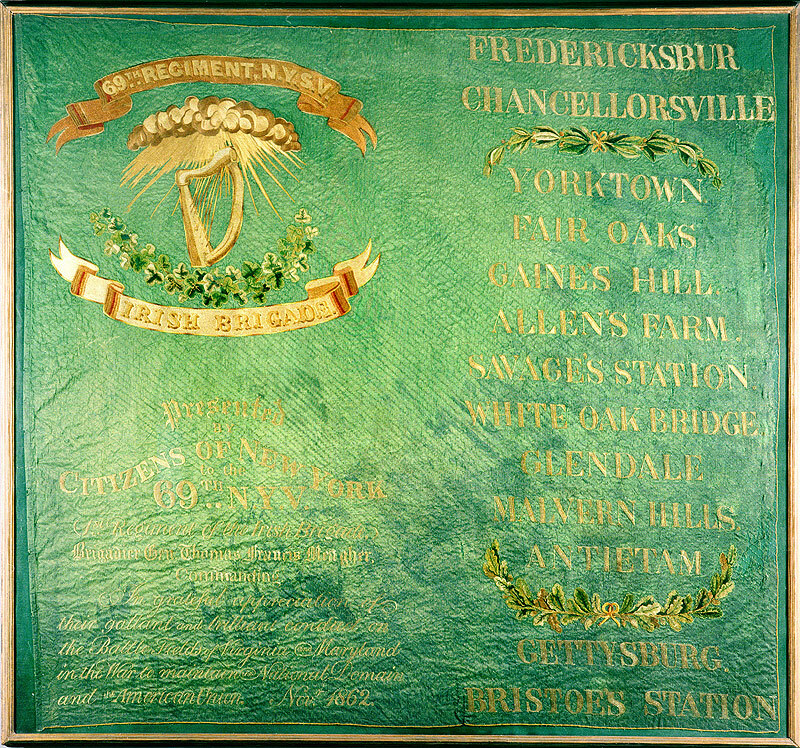 It first came to prominence in Irish-American circles among the Fenian Brotherhood of America (FBA), whose name was drawn from the Fianna legends, and was latterly made use of in Ireland by its European sister-organisation, the Irish Republican Brotherhood or IRB (hence the Gal Gréine being known as the Fenian Sunburst). 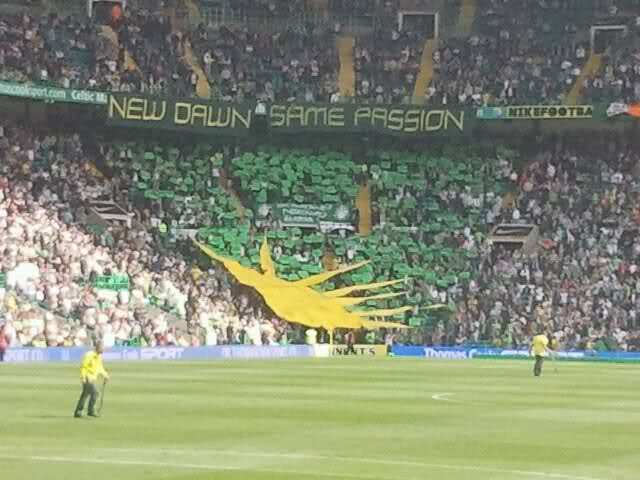 In terms of the imagery involved, Fenian devices favoured the green of traditional nationalist banners rather than the folkloric blue and usually showed a pictorial golden sunburst emerging from behind a cloud instead of from below the horizon. 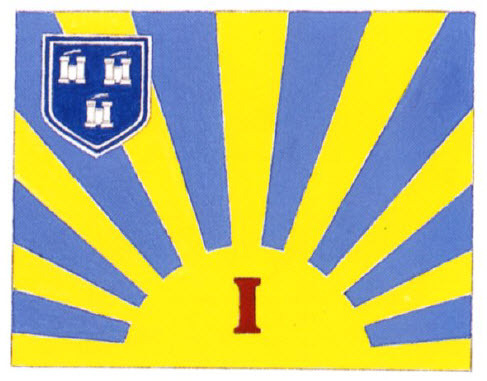 Most sunbursts were centred in the middle of the flag but some placed the image at the bottom or top-right. 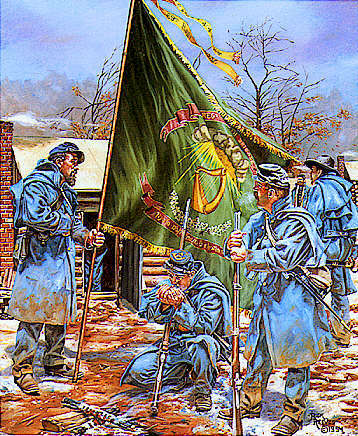 During the American Civil War (1861–1865) many Irish-American regiments and units made use of the Gal Gréine in their flags (frequently combined with the more popular harp). 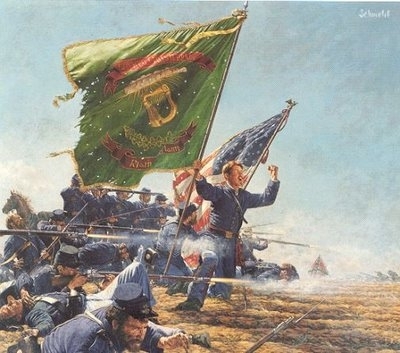 This invariably reflected the numbers of Fenians in their ranks or the founding of formations based upon existing FBA groups (this phenomenon was mainly confined to the armies of the Union: for reasons of geography and ideology Confederate forces attracted fewer Fenian recruits). After the 1870s the Gal Gréine declined in popular use until it reappeared again in the late 1800s and early 1900s. 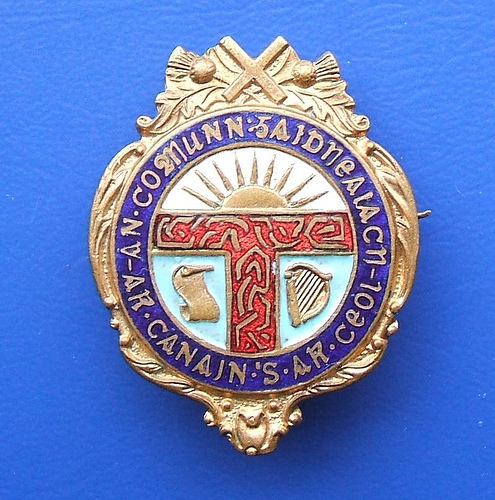 In 1893 the Irish cultural organisation Conradh na Gaeilge or the Gaelic League was established in Dublin and almost immediately began to make use of sunburst iconography in its publications and symbols. 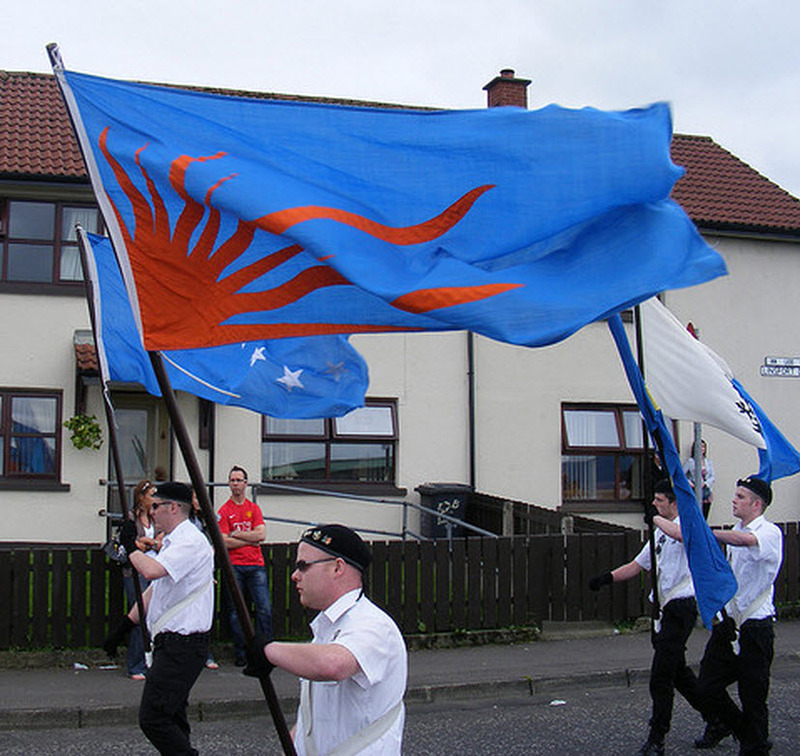 Around the same time several similar groupings in Scotland, including An Comunn Gàidhealach, adopted the Sunburst for their needs (the first published journal of the organisation was titled An Deò-Ghrèine “The smoke, fume, haze of the sun”; i.e. the sunburst). 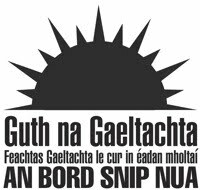 To the present day the icon remains popular amongst language or indigenous rights groups in Ireland and Scotland, such as Guth na Gaeltachta. 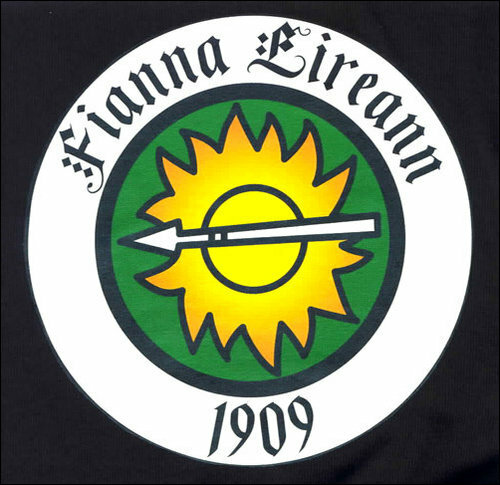 In early 1900 the Irish republican activist and feminist Countess Markievicz founded the Iníonacha na hÉireann, a radical women’s organisation which used an embroidered version of the golden sunburst as a badge on a blue sash worn over the shoulder. 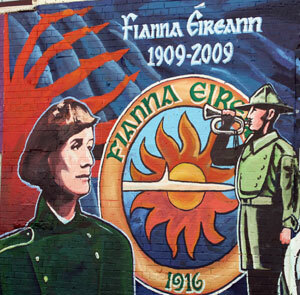 Later in 1909 the Gal Gréine was also adopted by the IRB-sponsored Fianna Éireann (FÉ), an Irish scouting organisation which was to play a prominent role in the Irish Revolution of 1916-1923 as the de facto youth wing of Óglaigh na hÉireann (ÓnaÉ) or the Irish Republican Army (IRA). 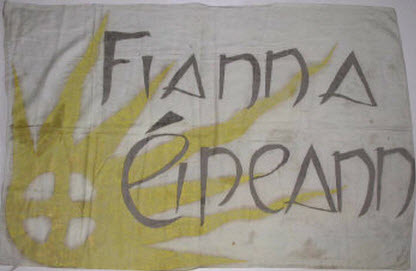 The FÉ flag was designed by Countess Markievicz and initially resembled the original manuscript version with a golden (yellow) sunburst placed in the lower half of the banner as a semi-circle or centrally as a round circle on a blue background (much later the sun was shown emerging from the bottom right-hand corner). 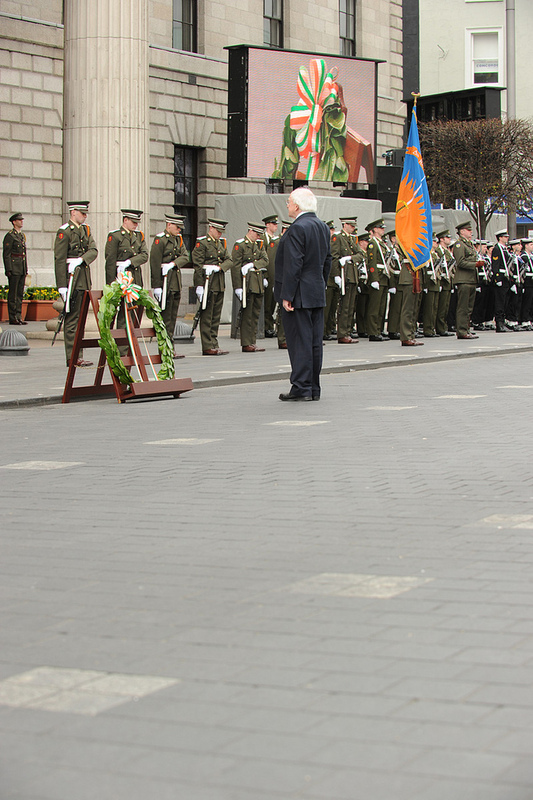 Most flags had the name “Fianna Éireann” inscribed above the sunburst in a golden stylised script. 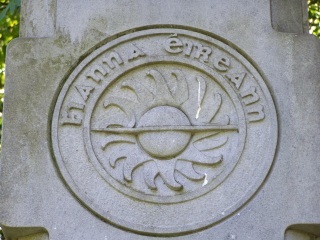 The fifteen points of the sunburst were interpreted within the movement as representing the twelve points of the medieval Fianna’s legendary “code of honour” and the three elements of the Fianna motto: Glaine ár gcroí, neart ár ngéag agus beart de réir ár mbriathar “The purity of our hearts, the strength of our limbs and our commitment to our promise” (since 1980 this slogan has been used by the Sciathán Fiannóglaigh or Rangers’ Wing, the special forces unit of Óglaigh an hÉireann or Defence Forces Ireland). 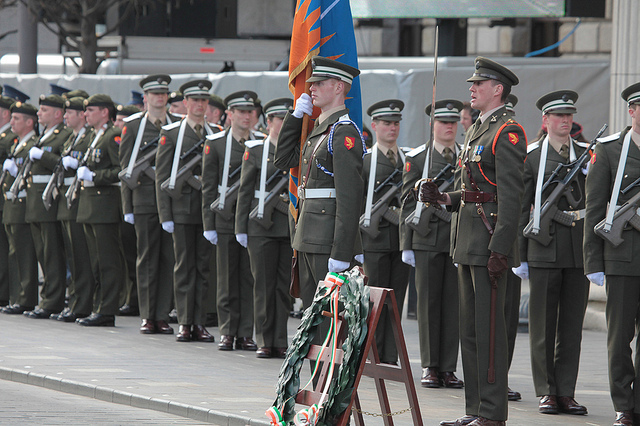 On the 25th of November 1913 the Irish Volunteer Force or Irish Volunteers (IV) was founded in Dublin by a number of prominent nationalists and republicans from across the country. 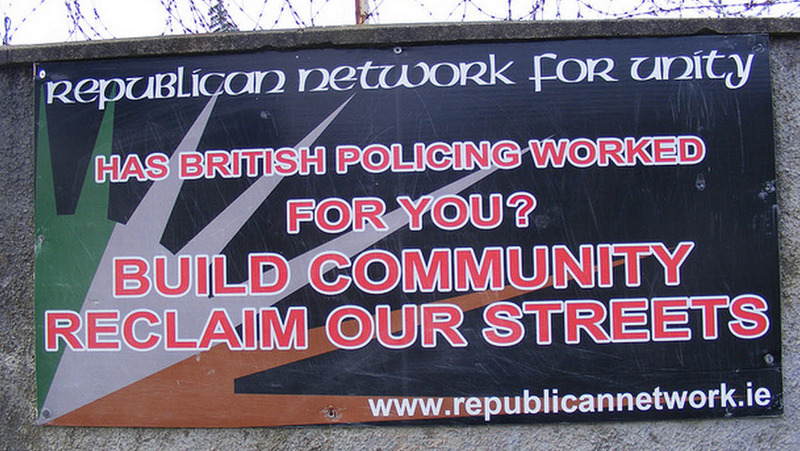 It was conceived of as a military organisation to defend the promised granting of so-called “home rule” or limited self-government to Ireland within the United Kingdom. 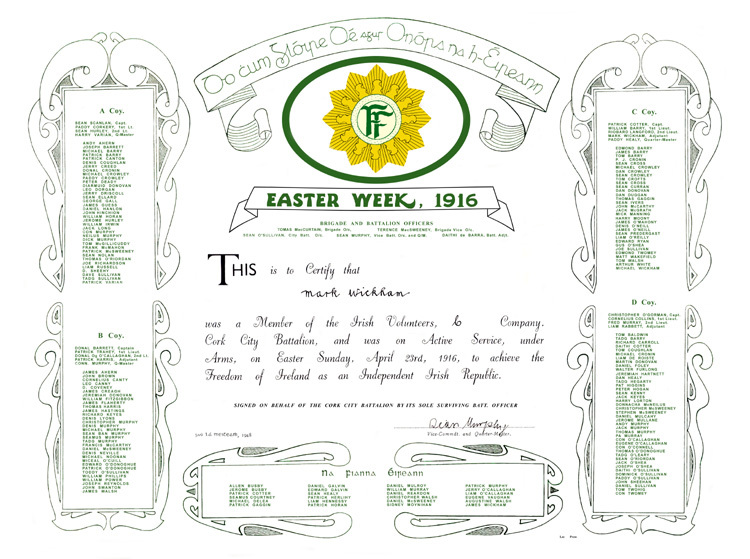 Hugely popular, it attracted a membership in the tens of thousands and among the first acts of its founders was the setting up of a committee to oversee the creation of agreed uniforms, badges and emblems under the chairmanship of the Protestant Irish language scholar and Gaelic League member Eoin Mac Néill. 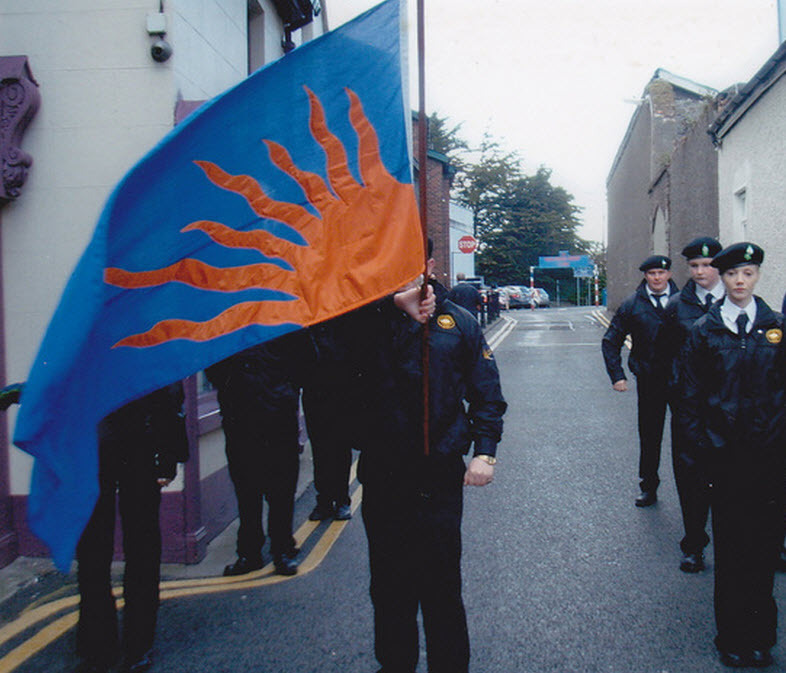 Mac Néill along with fellow committee-member Pádraig Mac Piarais chose the sunburst banner as a flag for the movement (appropriately enough given its heavy Fenian membership and influence). 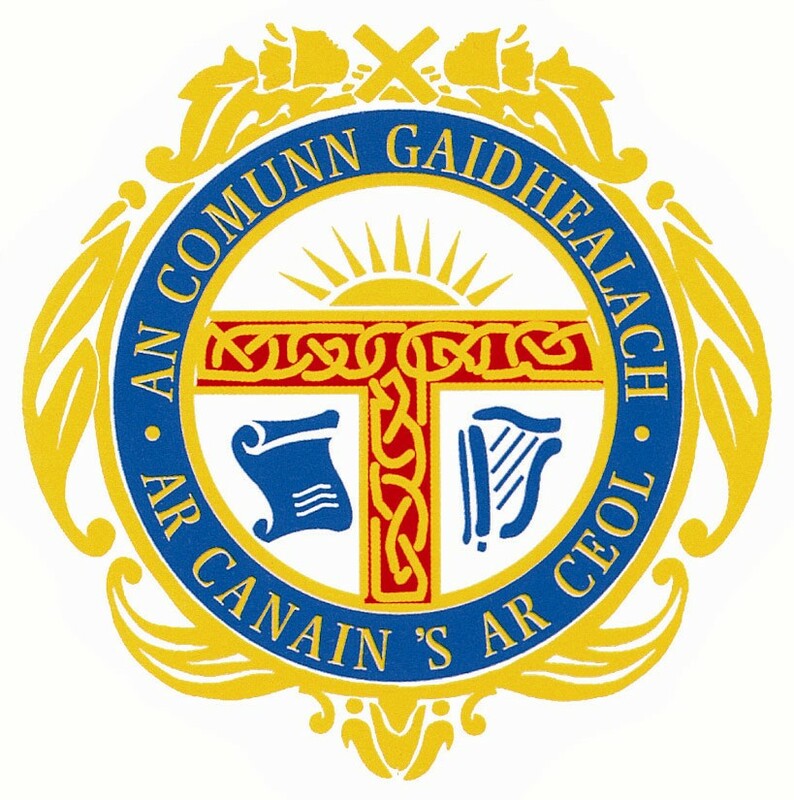 Mac Piarais’ school, Scoil Éanna, had used a version of the Gal Gréine as its symbol, a gold sun disc on a blue background, since 1908. 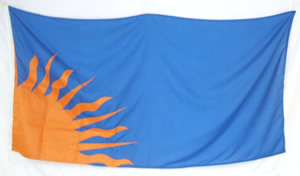 This standard was blue in colour with a semi-circular nine-pointed golden (yellow) sunburst in the lower middle of the flag. 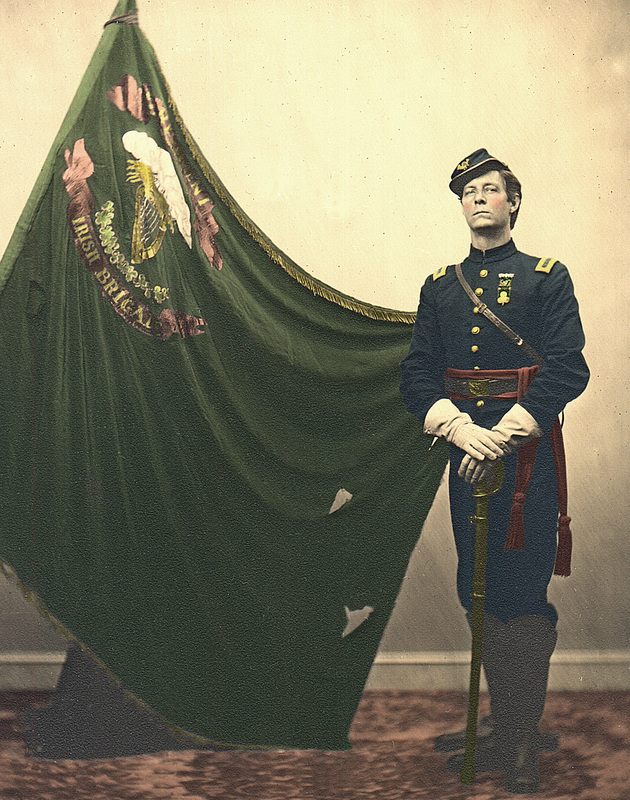 The logos of particular regiments were to be embroidered in the flag’s top-left corner. 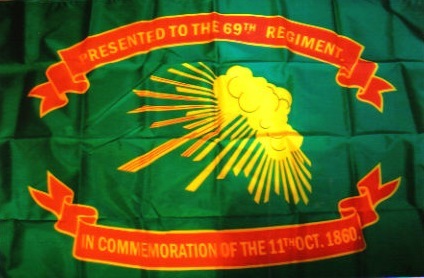 However, though some banners were created to this specification, opposition by several influential anti-republican nationalists (who favoured the harp symbol identified most readily with the Irish Parliamentary Party) and an ideological split in the Volunteers in September 1914 meant that the Fenian Sunburst possibly missed becoming the national flag of Ireland. 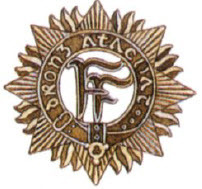 The uniform and cap badge of the Volunteers, popularly called the Fianna Fáil or FF badge, was also based upon the Gal Gréine, using a sketch by Mac Néill. 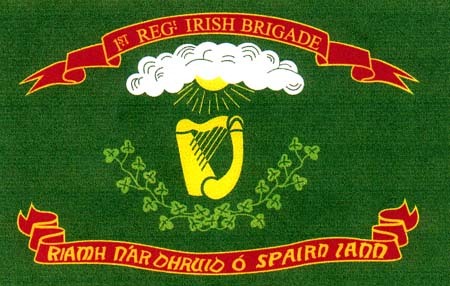 He originally designed the badge for the Volunteer’s Dublin Brigade but after the split in the organisation a variant of it was adopted by the entire movement and was found on uniform flashes, badges, buttons, some flags and documentation. 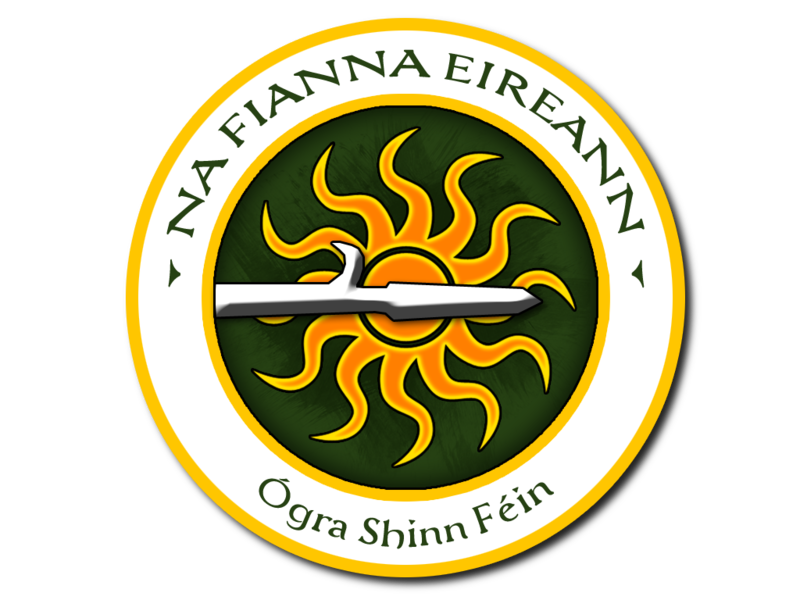 It consisted of a round sunburst with the initials “FF” in Irish script at its centre (Fianna Fáil or “Warriors of Destiny” was both the slogan and an early Irish language name of the Volunteers from a suggestion by the writer and linguist Peadar Ó Laoghaire). 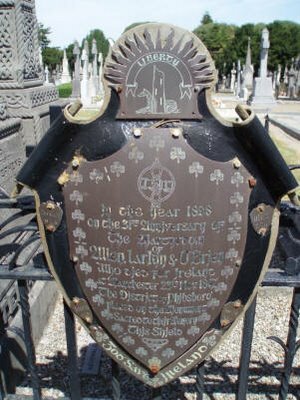 Around the initials were placed a warrior’s belt upon which was written the words Óglaigh na hÉireann in the same alphabet: “the (Military) Volunteers of Ireland” being a suggested translation into Irish of the English term “Irish Volunteers” by the writer Piaras Béaslaí. An eight-pointed star was added to the design for stylistic reasons. 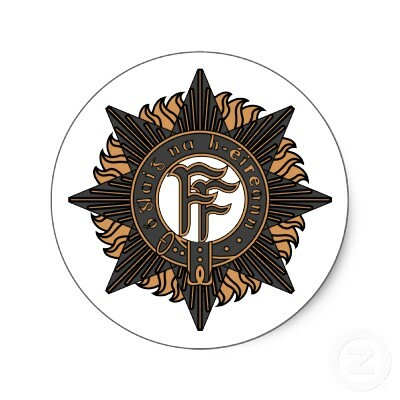 After the War of Independence the FF badge was gradually discarded by those Irish forces descended from the revolutionary-era Anti-Treaty IRA while the organisational descendants of the Pro-Treaty IRA, Defence Forces Ireland, retained it as their official emblem. However both traditions adhered to the Gal Gréine, albeit based upon slightly different artistic interpretations. 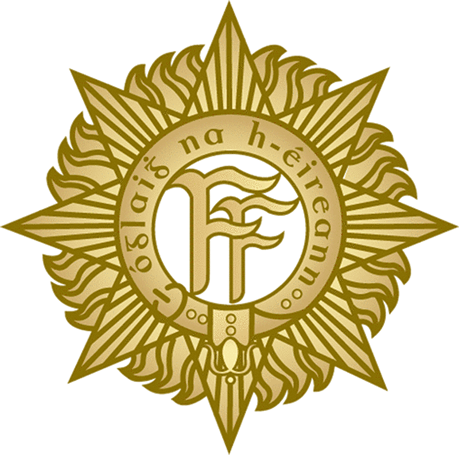 The Irish Army’s Military College uses a variant of the banner close to the early 20th century Fianna Éireann version, where the half-sun and its expanding rays are centred on the lower edge of the flag, the sunbeams alternating between short and slightly longer ones. 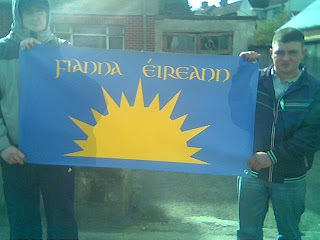 In contrast most Irish republican flags tend to place a quarter-sun in the lower left-hand corner of the flag with rays emanating outwards (this is particularly true of banners produced since the 1990s). These sun-beams can be straight, wavy, or alternating between both and often varying in length and in all cases represent a rising sun. However from the 1970s onwards both “official” and “unofficial” Sunbursts have changed from the traditional gold or yellow to a distinct orange hue reflecting the final block of the Irish national flag or Tricolour. 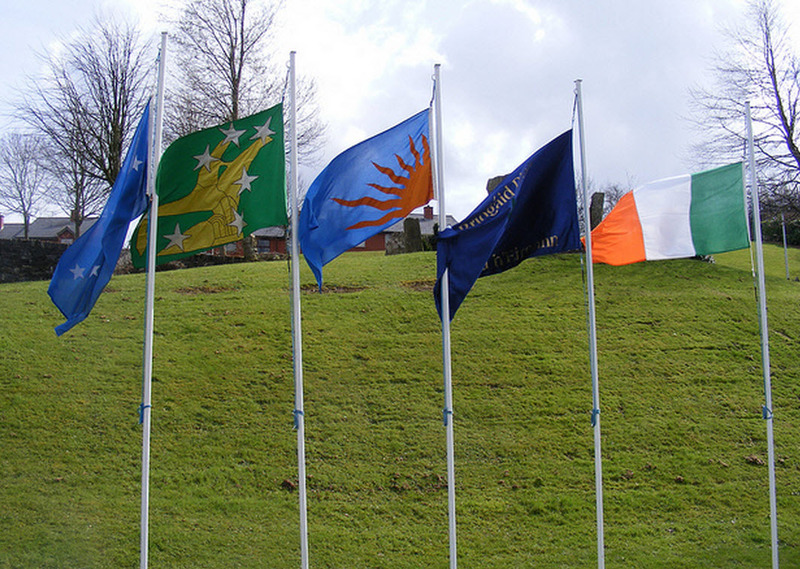 If any symbol has the claim to be the indigenous flag of Ireland it is surely the Gal Gréine. And one, perhaps, in some ways more fitting than the present one. Gal Gréine, literally “Fury, heat of the Sun” with the intended meaning of a “Sunburst” (i.e. the flash of the sun as it emerges above the horizon at dawn or from behind a cloud during the day). Scal Ghréine, alternative name for the Sunburst, meaning “Burst, flash, blast of the Sun”. Déo-Ghréine, alternative name for the Sunburst, meaning “Smoke, glimmer, ray of the Sun”. Deò-Ghrèine, alternative Scottish name for the Sunburst, meaning “Smoke, glimmer, ray of the Sun”. 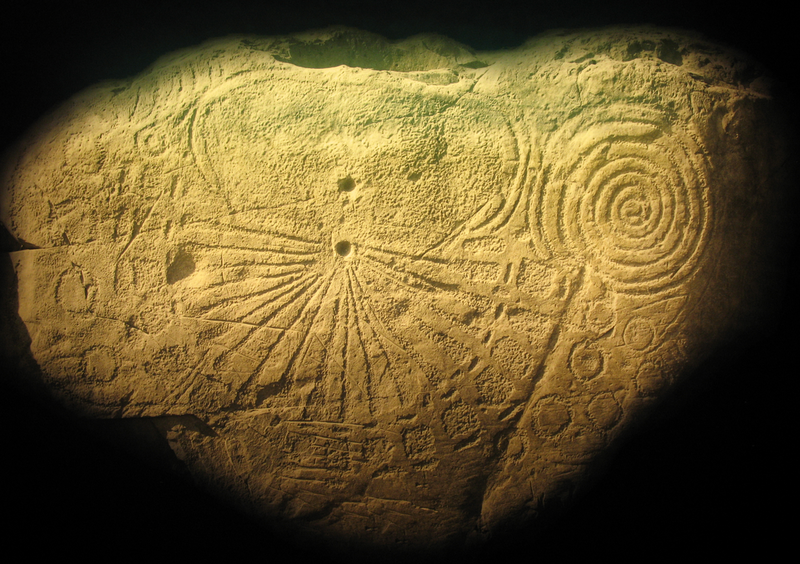 Dealbh Ghréine, alternative name for the Sunburst, meaning “Image, form, appearance of the Sun”. Bhí sé sin an-suimiúil. Ní raibh a fhios agam go raibh an tsiombail sin chomh tábhachtach mar sin. Grma as na pictiúirí friesin. Is brea liom do bhlag. 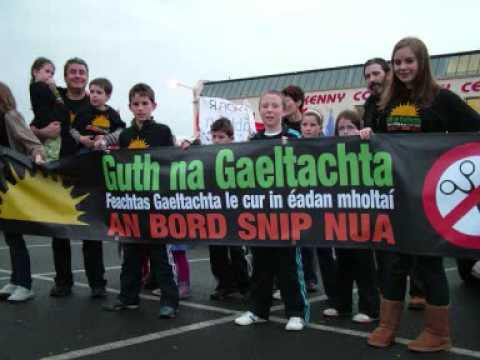 An maith leat Amhráin Gaeilge? Féach ar mo shuíomh nua! Glad to have helped. It is one of my favourite authentically Irish symbols, especially given the weight of history behind it. Very, very interesting article. The imagery of an Gal Gréine is very beautiful and fascinating. 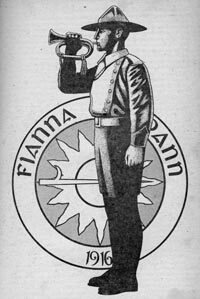 I have often doodled the same image in my life so it is interesting to make the link to the Fianna and to Ireland… a subconscious link the I have perhaps been making my entire life. 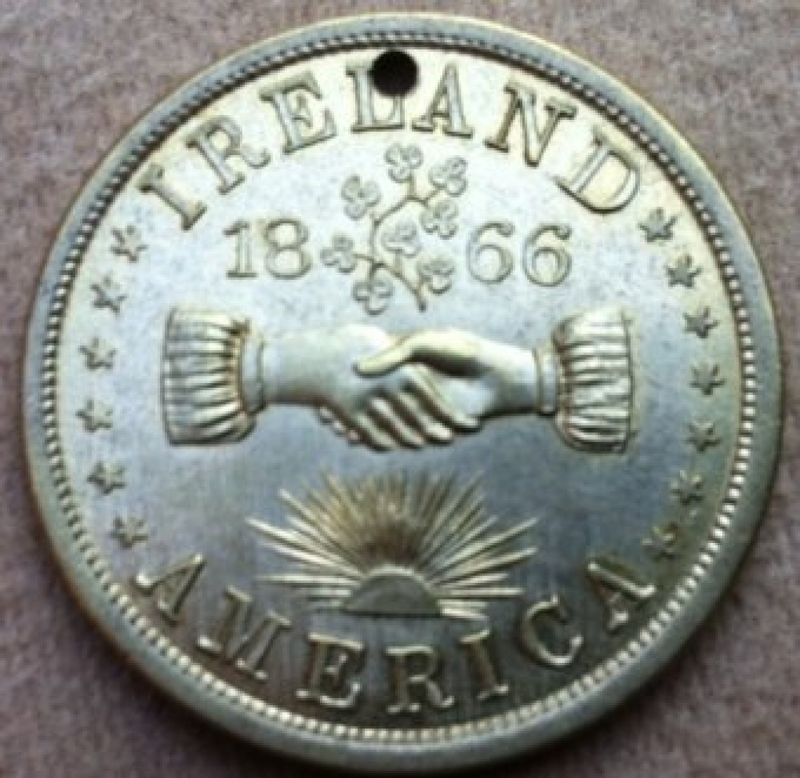 As a Canadian, the Fenian / US link is a surprise. 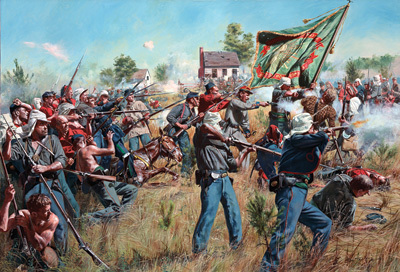 In our history, the British protected us against the US / Fenian attacks. If these attacks would have been successfull, we would be part of the USer Manifest Destiny. 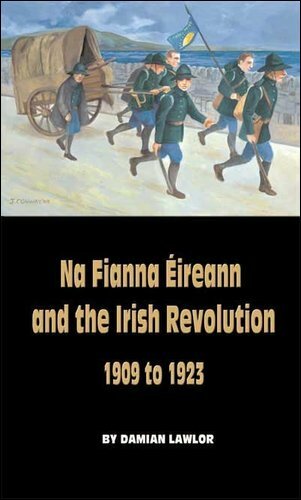 History is complex and as I learn more about the ripple effects of the Irish fighting against Imperialism, it becomes clear that Imperialism is a moving target.